Migrants' bid to storm Channel Tunnel Jump to media player Channel Tunnel services are disrupted after around 150 migrants attempt to storm the terminal in Calais. Who cares for child migrants to UK? Jump to media player Some UK local authorities say they are struggling to cope with the large increase in the number of children seeking asylum. 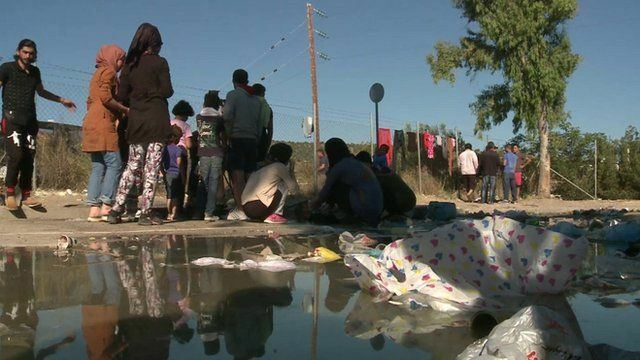 Hungary's open border crossing for migrants Jump to media player Nick Thorpe visits one of the popular crossing points for illegal immigrants on the border between Hungary and Serbia. Police on the Greek island of Lesbos are reporting a big increase in the number of migrants. They say 1,600 arrived on Saturday breaking all previous records. Many are believed to be fleeing the conflict in Syria. The island's only detention facility is overwhelmed and a makeshift camp set up on an abandoned race track is also unable to cope.